The hot topic in the news lately has been immigration. Some call them “undocumented” while others prefer “illegal” to describe the wave of invaders coming across the Southern Border of the United States. This issue is full of more pitfalls for Republicans who have allowed themselves to be defined by those hoping to cultivate political support from these potential voters. Many have let themselves be falsely identified as bigots and racists for wanting to uphold current immigration laws. Other Republicans are so traumatized by this stigma hanging over them that they are running along side of the McCain express to nowhere. On the other hand, there is a segment of this group that are regular voters for the Democrats. There is much voter fraud in our system especially by illegals; just ask B-1 Bob Dornan. Democrats control the system and have no intention of fixing a rigged system that benefits them both on Election Day and every ten years in the census. We need a political leader to find a realistic balance between protecting our national interests of security and this mass of humanity that is already here. Unfortunately, President Bush is back to his pre-9/11 position on the issue, while the Senate Republicans and all of the Democrats are playing politics with peoples lives and the security of our nation. The goal of this current round of talk on immigration reform is just an elaborate ruse to stakeout election year territory. Michael Savage is correct that it is about borders, language and culture but he is not the right messenger to convince the masses. Savage is good at confrontation but persuasion is not his leading attribute. Both Huge Hewitt and Rush Limbaugh have been bringing out different and insightful comments on this issue. 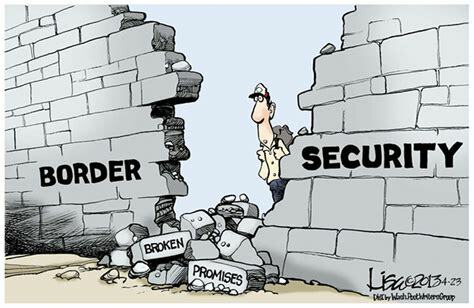 Hewitt advocates building a real wall along the border and patrolling it to keep illegals out. It would cut down on the rate of illegal immigration. Limbaugh says make them all legal but don’t give them the right to vote if they entered illegally. If that is too hot to handle he suggested just barring illegals from voting right now. His point is that the Democrats (and some Republicans) don’t really care about fixing immigration; they are just positioning themselves to get votes from these people. I have had dealings with the Immigration and Naturalization Service (mostly before it was taken over by the Department of Homeland Security) and the system is broke. It needs to be reinvented from scratch. It may have been state-of-the-art in the 1930’s but it is based on an unworkable and obsolete paradigm of information processing. In addition, the artificial quotas mandated by Congress on who can come here only make the problem worse. The numbers of people allowed to enter each year are too low to make it worthwhile for people to follow our rules for getting here. Immigration policy is the only part of the government that mandates quotas on race, religion and national origin. The role of the State Department in the immigration process also adds many layers and delays to this cumbersome process. My feeling right now is a pox on both parties. Lastly, the strawman that gets beat-up by both Republicans and Democrats is the cry to go after employers of illegals. Anybody that says this is ignorant and has never signed the front of a paycheck. If you apply for a job in this country and have the necessary documents required by the Form I-9 then I have to hire you. As a practical matter, it is illegal for me not to hire you ever if I suspect your documents are bogus. There is no government-authorized mechanism to verify if you are really a citizen. In fact you don’t need to show me a Social Security Card to meet the requirements on the Form I-9! As an employer, I can get very limited information from the Social Security Administration on a pass/fail basis with no explanation why they don’t like a Social Security Number. I get a letter from them ever year telling me one fourth on our employees have bad numbers but the same letter emphasizes that it is illegal to fire someone that you think might have phony papers. Their letter makes it clear that this is a matter directly between the Social Security administration and the employee. The government reserves all power in this area for themselves. Without the means to verify the legitimacy of potential employees, no enforcement on the hiring practices of employers is warranted. Last year, only three employers in the entire country were prosecuted for hiring illegals!